Our family reunions date back to the 1950s. 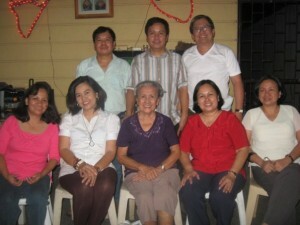 We had a faint recollection of our 1960 clan reunion held in Lopez, Quezon. Yes, it was a clan reunion, meaning, relations fifth level removed. In this country, a third cousin is a prized relative never to be messed up with. A third cousin means his and our great-grandparents are siblings. Relatives with common ancestors congregate in one big old house somewhere in Calle Anda in Lopez, its owner we could no longer recall. What visits our memory is what appeared to be an old woman whose weathered face had seen better times. Our grandmother, Ina Favia, deferred reverentially to her as Impong Consuelo. 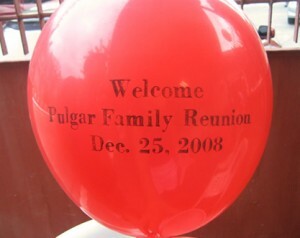 In that reunion we saw our fair-skinned relations from the family of Celso Pulgar. Tio Celso’s brood was in the main, girls of striking beauty. We took fancy on one of the Kuya Celso’s girls by grabbing her attention. While she was perched on the swing, we pushed her as hard as we could. We thought she wanted a Supergirl act and if she was about airborne she’d be appreciative of our assist. Instead, we got her goat. Getting off from the contraption, she called us her “kababag-anak“. Just as we told you, she was never to be messed up with! The Uranzas and the Floridos and the Capanzanas and the Leopandos and the Martinezes and the Unlayaos and the Requintos and the Torreses and the Nanteses were there. It was a well-attended Christmas get-together. That was the last time our great clan from Esperanza-Canda-Tan-ag-de La Paz-San Roque all in Lopez, Pipisik and Hagakhakin in Gumaca, and Calauag had a great gathering. The last time we heard was that old Impong Consuelo died in her sleep in that same year. She was in her 90s. In 1961 only the family of Ina Favia, widowed in the 1950s, held her first family reunion this time in Calauag. She decided to have her own get-together because of her growing family and just in time to welcome her children who were then on vacation from Manila as students. Tito Honey was enrolled in Feati taking up an engineering course, Tito Phil in UE as an accounting student, Tita Ling, a UST medical intern, and Tita Sonia into an education degree. “the motive for the kidnapping and killing of Lt. Amadeo Lozanes of the Hunters was the keen rivalry between the Vera’s Guerrilla Party and the Hunter’s ROTC Guerrilla organizations. It is noteworthy that the Hunters were driven away by General Vera from Pitogo in December, 1944, and that after said kidnapping and killing on February 13 and 14, 1945, Mayor Ramon Isaac of Unisan, was in turn kidnapped by the Hunters. Leopoldo Miciano, secretary of Col. de Luna of the Vera’s Guerrilla Party, testified that General Vera told him of his (Vera’s) suspicion that Mayor Isaac was kidnapped by way of reprisal as he, Vera, had ordered the liquidation of Lt. Lozanes (dinispatcha). Kuya Igna nurtured the suspicion that one Chinaman in Calauag, during the war, was contacting the enemies on the sly, and in one confrontation injured his suspect leaving the Chinaman permanently blind in one eye. That explains why the children of Lim Ychuan avoided the Pulgar family name like a plague. Kuya Oti, who died early this year, acquired US citizenship owing to his USAFFE services. He stayed briefly in Brooklyn, New York. The civil courts exonerated them however one after another. As war veterans, all their children became professionals enjoying scholarships with stipends courtesy of the US Veterans Commission. That first exclusive family reunion in 1961 was held in our old house along Quezon St. It was capped first by a long serenade of Ina Favia by her entire brood. “Ang Pasko ay Sumapit” became our Yuletide national anthem, sang year after year, followed by other more familiar Christmas carols while Ina, in her signature Lumban Quimona, was seated in the second floor window all by herself, gazing down at all of us, and teary eyed. Right after the serenade, all the guests were ushered in the kusina at the back of the two-storey wooden house where a long dining table for twenty two persons made of maulawin waited for them. The night before Kuya Peping and Kuya Cesar, both in-laws, were all busied up dressing animal carcasses ready to be transformed into great dinuguan, apritada, menudo, and inihaw. All the ladies were on hand scraping papayang manibalang for achara. 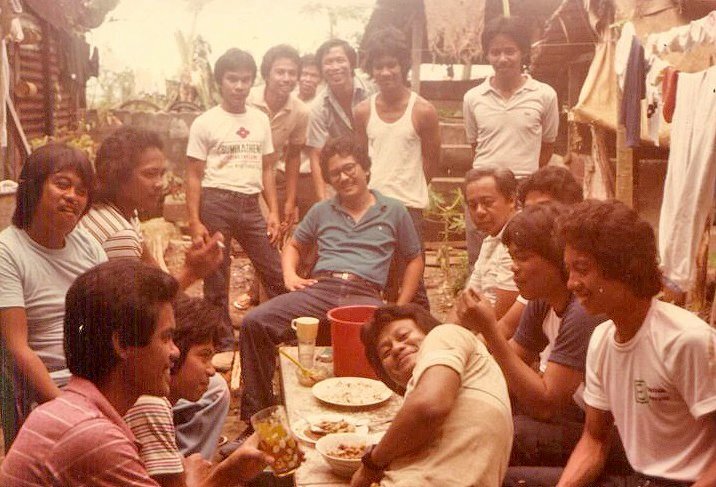 As kids, we dreaded loitering in the kusina where the taliasis as big as pawikan were steaming with innards their frightening mouths enough to gobble us up and never to be traced again. The skill of Kusinerong Castor, the grandfather of the Follosos, never failed to amaze us with his facility of sanitizing the kalinawan and lamang loob for thick dinuguan and spicy kandingga. All the kasama of Ina from San Roque and her all-widow entourage were given special mention and individual kalagimay from the old lady. The little kalagimays were filled with tikoy, suman, monay, Serg’s chocolate and coins. Before we partake of her handa from San Roque she led us to her special prayer of thanksgiving to her patron, San Roque, for the generous gifts we all received the last twelve months. After the sumptuous tanghalian, each grandchild had to show his terpsichorean talent. The older apos like Ate Ludy and Ate Aden managed to sing some love songs of Brenda Lee and Petula Clark. They were joined by Tita Ling and Tita Sonia with their portable turntable and did some dances to the accompaniment of the vinyl 45s of Gary Lewis and the Dave Clark Five. Our rendition of Sa Bahay Ni Kang Para was a hit among the Lambanog boys chaired by Tio Nesto. Right after the program, Ina led her ceremonial prayer. It was the same invocation she recited in San Roque every 16th of May. The shiny Lambanog from Pisipis and De la Paz flooded the Pulgar abode. By nightfall we never failed to see the prostrate figures of drunks adorning the yakal staircase of the old house. Our reunions were memorable because of special bakes from Puyat Philippine Four Mills in Hondagua where Tito Phil eventually worked as pay master. A day before Christmas, Tito Phil made it a point to instruct the Puyat helicopter pilot straight from Makati to circle the old house in Quezon St., before landing in Hondagua to deliver the bonuses and payroll. That gave us the signal that Tito Phil had arrived and the pastries on our annual gathering. On occasions, Tito Jay, a US based Navy officer, visited his fiancée Tita Ling on Christmas days armed with PX goods from the commissary of Subic Cubi Point. With nine children spread all over, yearly hosting was assigned from the eldest to the youngest and on with the cycle. Our reunions went on until 1994 when Ina Favia died in Las Pinas. Just like after the death of Impong Consuelo, and our Ina was no longer with us, our family, the Higino branch, decided to go it all alone this time in Manila where most of us are already based. From 1995 till now, we have the same Christmas assignation rotated from the eldest to the youngest. This year is our turn. 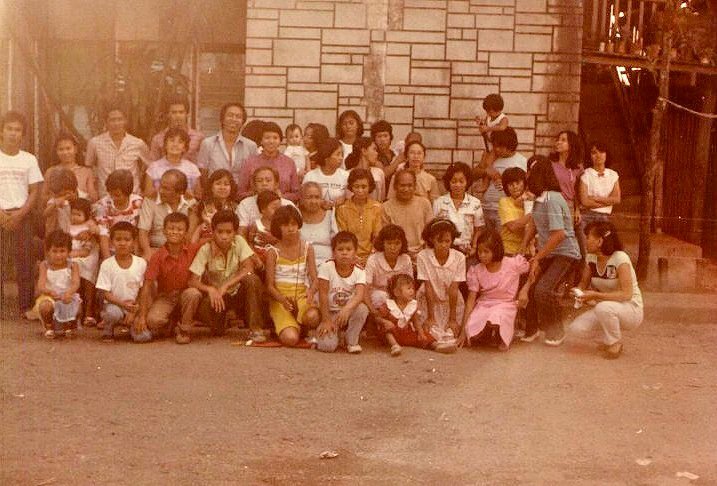 In other words, as far back as Impong Consuelo, the latest editions of our family have observed the tradition and see each other once a year for more than half a century since. A week before Christmas we practically stayed the whole day in the wet market and SM. What could be the most practical gifts within the latitude of limited financial parameter, read: scarce cash due to economic recession? Our destination was a give away, the wet market. The wet market has everything. Why loaf in the supermarkets when prices in these places have skyrocketed just in time for the season? And SM? Of course, this mall is well tuned in the financial language of the middle class by talking with it along the lingo both of them understand: Sale! In it, there is also the universe of designs for disposable (biodegradable) paper plates, utensils, and paper cups. In the wet market we were able to buy several kilos of deboned and skinned fresh silvery Bonuan bangus for relleno. For an extra P20 per piece, the fish is cleaned, deboned, and skinned. The leathery skin is separated from the meat ready to be minced and mixed with the missus’ secret formula for her famous super pescado recipe. Just like Ina, our 80-year old matriarch has made it a point that no sibling, without regard to financial wherewithal, shall shoulder by himself/herself, the cost of the reunion. The policy was potluck for every sibling with reasonable notice so that there will be no duplication. By bringing just one simple unique dish (and we are seven not to mention cousins who are Manila-based as well) we are assured of the to-die for putaje from each attendee. Her rationale is by being focused in the preparation of one dish, there is no reason why it won’t turn out to be the best. There is therefore satisfaction in the sharing. The real reason actually is not in the food compliance, but the presence and the pleasure of togetherness. 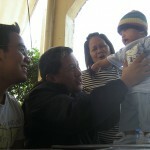 For a Pinoy, his one true thing is his family and that makes him happy in the well-being department. 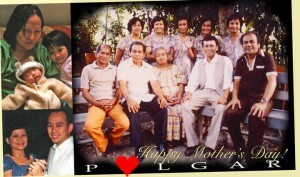 The Impo, Ina Favia, and now our 80-year old Super Mom know that only too well. As for the gifts to all and sundry, we made it already a tradition (our younger siblings still get to enjoy gift wrapping) to give a book store gift certificate to encourage our family to book familiarity. The gift certificate or GC slashes the cost of gift giving like wraps, boxes, and scotch tapes (not to mention time economy in gift scouting that fits well to the recipients). From the wet market we proceeded to Suncheers, a party thingamajig provider. We borrowed collapsible tables (with red table cloth) and chairs with balloons in sticks. Next we called Jerry Leal for one videoke machine rented for P500.00 per bash. A videoke doesn’t fail to sustain the momentum of the occasion as there would always be an entertainer from every member of the families present belting out an archaic or latest ballad. And the end-o’-the-year party doesn’t look like one without a glistening golden lechon. For a little less than a good fortune, we placed our order in Jomari & JJ Duran along National Road in Tunasan. The queue was kilometric where we ended up in the hot and flaming ikutan where still a number of swine carcasses were swivelled atop crimson coals stoked by sweating half naked lechoneros in the labyrinthine looban along the railroad track. The Tunasan lechonan has equalled if not eclipsed Retiro in instant roast pig dish. On the appointed day, each family member together with his brood came trickling in. Our phone practically burned for dishing out continuous instructions for direction on where again to find the event’s venue. That meant they forgot where in heaven’s name is our house because it was ages ago the last time we were together. Susie’s Joey barely walked when we last hosted. Now, Joey is a handsome 15-year old. Everybody was on tenterhooks upon arrival not because of the twist and turn of finding the place but because of grumbling tummies. It was already lunchtime when much of the invitees showed up. But the table-for-six was ready for the heavy appetite. In a jiffy, Ang Pasko Ay Sumapit was rendered, the serenaders, pale as a foot sole, sang the anthem in the direction of our misty-eyed 80-year old matriarch. And everybody pulverized the waiting table. 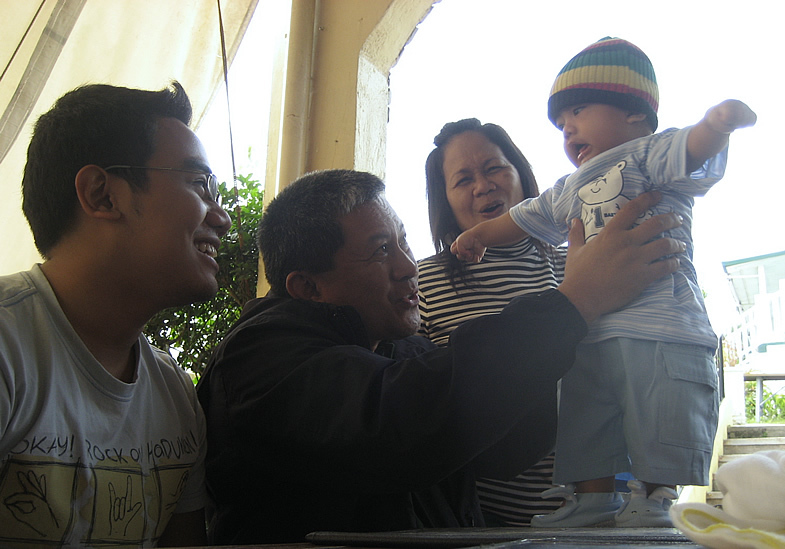 This reunion is memorable, because 7-month old Mayo Inigo Madrid Pulgar, the latest addition to the family, joined the affair. That is what reunions are all about. Nothing far from ringing out the old and ringing in the new. The old folks sit still in their chairs affectionately gazing at the new editions while the latter fidget in every which way. As the sun sets, the gate once again is flung open as if to disgorge the revellers from a year long euphoria and they are all trooping back to their own business. As we stood near the entrance, each car passes with all the pairs of hands sticking out of the window waving “auld lang synes,” until same time some place next year. Until they were gobbled up by the distant corner of the village. It’s probably Paang Bundok in Calauag. From the corner of the gate we saw the faint images of the Impo and the Ina dressed in their signature quimonas smiling in utter approval. While our mother, sprightly as ever, collected herself, retracing the returns of the day. 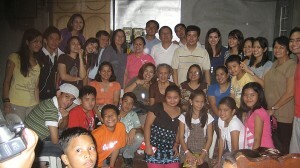 Pahiram nitong family picture nyo, guys! Will post it in our favorite website.